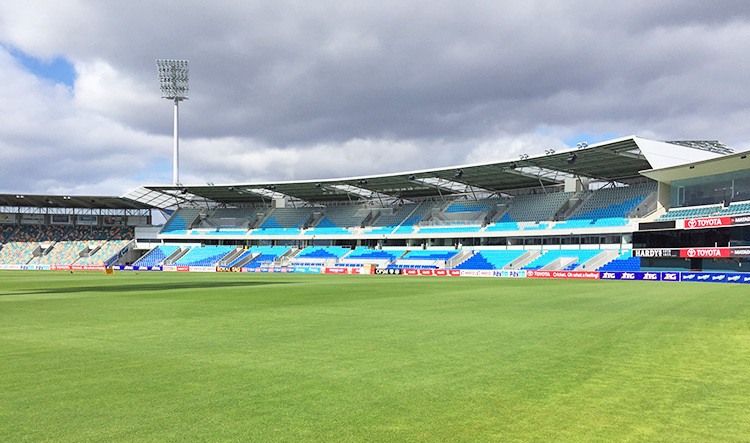 The new Western Grandstand was constructed to upgrade the Blundstone Arena capacity to 20,000 in time for the 2015 Cricket World Cup. The stand contains seating for 5,000 people as well as player, catering, media and coach facilities. To enhance viewing and provide the required open spaces, the project called for a precast concrete pre-fabricated building with in-situ concrete floor slabs and a steel framed, column free, 23 metre cantilevered roof canopy. Incorporated into the stand are a 20 metre clear span indoor sports hall located under the grandstand, and a 500 seat open column free function room. A world class International Cricket Venue with indoor practice facilities, food and beverage outlets, function room, corporate entertainment, coach and media boxes and a clear unobstructed seating area. The venue has successfully hosted International Series cricket and AFL matches.